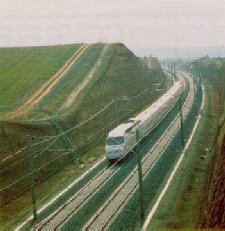 The AVE ("Alta Velocidad Española" or Spanish High Speed) is the high speed train of Spain. It is owned by the Spanish National Railways, RENFE, and has a high speed line between Madrid and Sevilla, and the present line between Barcelona and Valencia is being disposed for six Spanish broad gauge AVE units with a top speed of 220 kph. The AVE trainsets are made in Fance with some Spanish components. It derives directly from the French TGV (Train a Grand Vitesse) Atlantique, and has a top speed of 300 kph. The travel between Madrid-Puerta de Atocha and Sevilla-Santa Justa lasts two hours and a quarter without intermediate stops. The AVE track is similar to the one used with the ICE (Inter City Experimental), the German high speed train. It lays through 471 kilometres between Madrid and Sevilla. The switchs are about 132 metres length, admit a top speed of 300 kph straight and 160 kph in derivation and eight engines are needed to active them. The electric power is 25.000 V and is proportioned by a catenary system with concrete German masts. The train gets the electric power through two double pantographs installed in the rear part of the roof of each traction head. 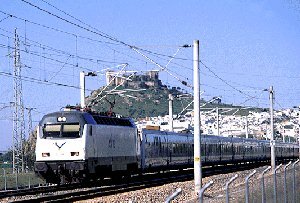 Also the Talgo 200, which covers the trajection Madrid-Huelva and Madrid-Cádiz using its variable gauge, runs on the high speed line. The Talgo 200 trainsets are pulled by electric locomotives class 252 fitted to run on the AVE tracks with a top speed of 220 kph.